A high profile delegation of World Vision leaders comprising the Regional Leader, National Directors and senior leadership from the South Asia and Pacific region visited Bangladesh from 16th-19th January 2017. 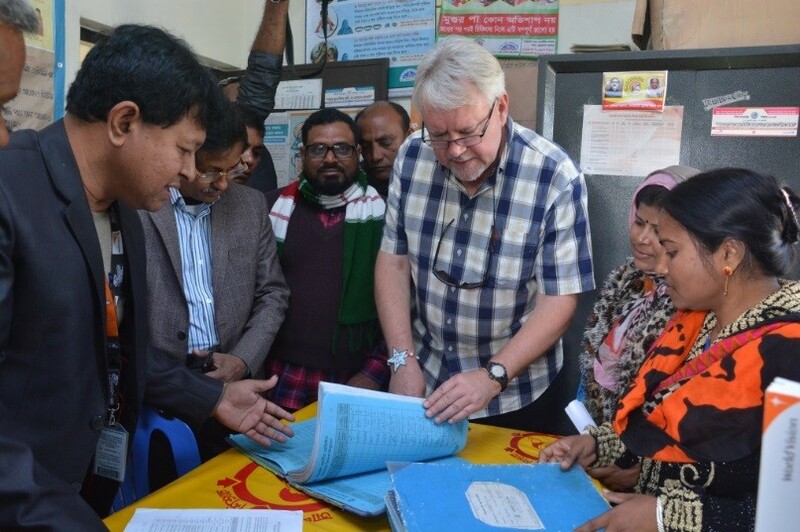 Embedded within the itinerary was a day long field visit to USAID’s Development Food Assistance Program (DFAP) Nobo Jatra with the full delegation travelling to Dacope Upazila (sub-district) in Khulna located in the southwest part of the country. Anchored within World Vision International’s first ever global strategy ‘Our Promise 2030: Building brighter futures for vulnerable children’ is the strategic imperative to collaborate and advocate for broader impact. An explicit objective for the field visit was to showcase and leverage Nobo Jatra as a benchmark for future joint ventures across the South Asia and Pacific Region with likeminded donors such as USAID who share similar goals to deliver high quality programs in the right places targeting the most vulnerable recipients. Given the tight timeframe coupled with the large geographical coverage of the Nobo Jatra working areas across four Upazila’s (sub-districts), the field visit was designed to maximize coverage and observation of front line program interventions at ground level. Following introductory presentations on Nobo Jatra and how the program operates within Dacope Upzaila, the delegates immediately proceeded with the onward journey to the interiors of the sub-district to garner a sense of the local landscape and observe Nobo Jatra activities in real time. During the visit, the delegates were able to visit a Community Clinic and observe a Community Support Group meeting under the Maternal Child Health and Nutrition (MCHN) component of Nobo Jatra. Community Clinics (CCs) , an innovative initiative of the Government of Bangladesh, have contributed significantly to the improvement of the overall antenatal and postnatal care in rural Bangladesh. CCs further contribute to the amelioration of nutrition in local communities with the aim of preventing stunting and maternal and child anemia. Observing a latrine validation meeting convened by the recently Nobo Jatra formed/re activated Ward level WATSAN committees was also ensconced within the field visit agenda. The visitors were also able to observe a household visit during which a WASH Organizer validated the data generated through the ICT based beneficiary registration process to vet appropriate locations in the local community to install the latrines whilst following all environmental compliance regulations. 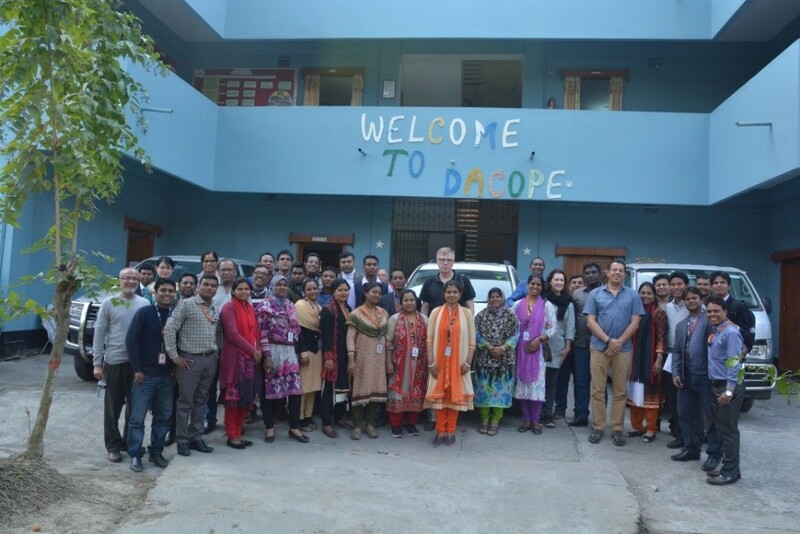 Across the board, the field visit was viewed as a tremendous ancillary by all present particularly by the dedicated Nobo Jatra team at ground level in Dacope as well as our valued partners from World Food Programme and Winrock International. 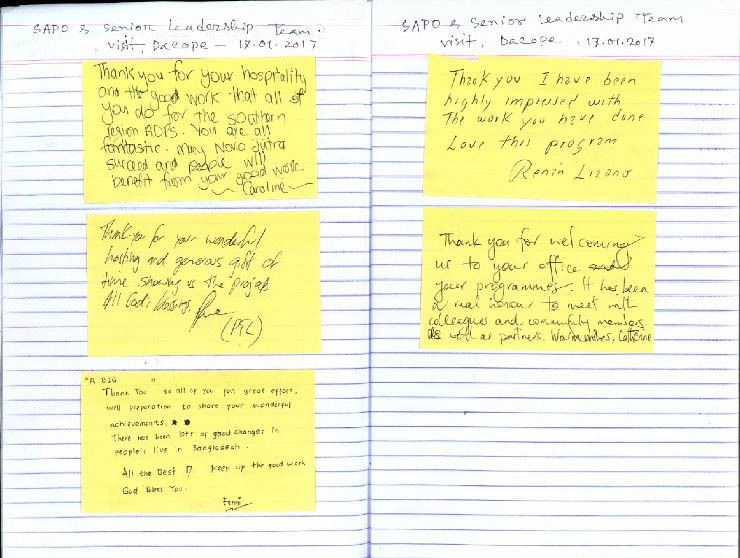 The commitment shown by the senior most leadership from the South Asia and Pacific region served to boost the morale of the team and further helped ensure buy in from the local community to Nobo Jatra interventions. Impressed by the high level of commitment witnessed from the Nobo Jatra team and interactions with program beneficiaries, World Vision Regional Leader, Jan de Waal, stated that ‘I am impressed with such progress in the early days of the project.’ The visit also helped with the longer term World Vision objective to engage in future joint ventures across the South Asia and Pacific Region with likeminded donors who share similar goals to deliver high quality programs in the right places targeting the most vulnerable recipients.